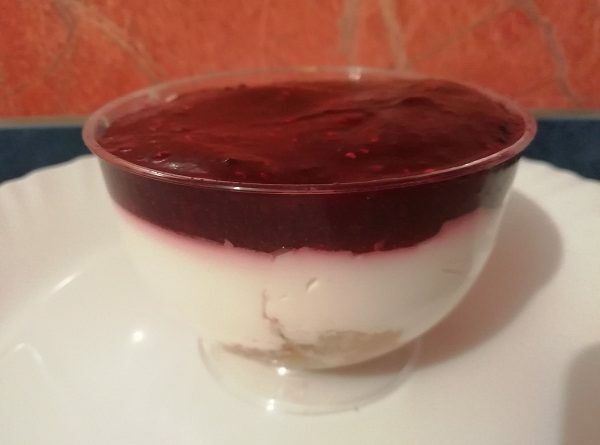 Easy and delicious no bake keto cheesecake with Raspberry jam. In a nonstick sauce pan, cook your raspberries and stevia until you get a thick consistency (jam like). This should take 5-8 minutes. Set it aside and let it completely cool down. Using a hand mixer, mix your cream cheese, 2 tbsp of lemon juice, lemon zest and stevia until you get a creamy consistency. In a separate bowl, start whisking your whipping cream until it get thick and firm. Don’t over whip it, the cream should be just thick enough that it stays on your whisk once you lift it. Add half of your whipped cream to your cream cheese filling and fold it in. Now add the other half, this time mix it in gently to make sure that your creamy filling remains light. Take 4 ramekins (tea cups, or espresso cups would work too), and place your cheesecake filling. Cover the bottom with 1/2 tablespoon almonds. Using the back of the spoon, spread it evenly and make sure the top is somewhat flat. Cover your ramekins and let them chill in the fridge for at least 30 minutes, ideally 1 hour. Take out of the fridge and scoop 1 tbsp of your berry jam and place it on top of your cheesecake.